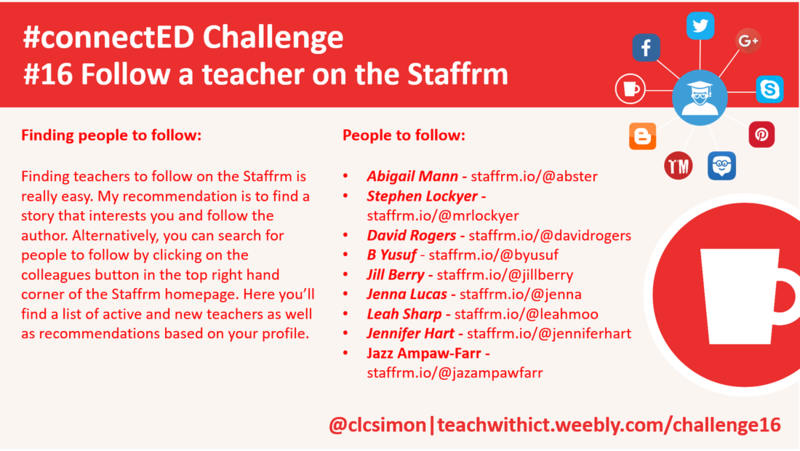 Challenge 16: ​Follow a teacher on Staffrm. ‘Thank you' and 'Well done' are words we all love to hear however, how often do we hear the words 'You are amazing' or 'You make a difference’, especially from those we seek recognition from most? Wouldn't it be great if we all had a magic mirror that told us every day how amazing we are! Well, if like me you don't have a magic mirror, the next best thing is a visit to the staff room. ​You will also find lots of advice, tips for managing your classroom and uplifting / inspirational stories that will remind you, if you need reminding, why you became a teacher in the first place! By far the simplest way to become connected on the Staffrm is to start following other teachers. Finding teachers to follow on the Staffrm is really easy. My recommendation is to find a story that interests you and follow the author. 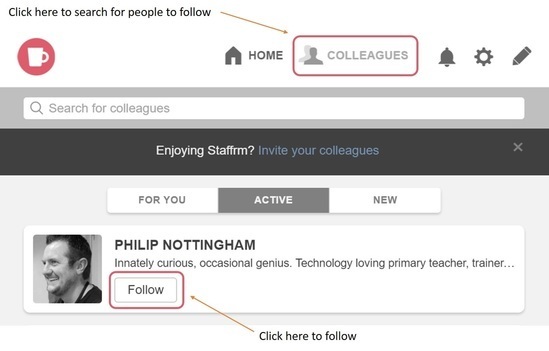 Alternatively, you can search for people to follow by clicking on the colleagues button in the top right hand corner of the Staffrm homepage. Here you’ll find a list of active and new teachers as well as recommendations based on your profile. Joining the staffrm is easy – best of all it’s free! To join and be part of the ever growing family, visit: http://staffrm.io/ and click on Join Staffrm today! – Trust me, you won’t regret it. Please note: This is not a definitive list, nor is it in any particular order. The aim of this list is to just help get you started!